Games such as Mindflex use headsets with simple electrodes to monitor levels of concentration and relaxation. (CNN) -- In the shimmering fantasy realm of the hit movie "Avatar," a paraplegic Marine leaves his wheelchair behind and finds his feet in a new virtual world thanks to "the link," a sophisticated chamber that connects his brain to a surrogate alien, via computer. This type of interface is a classic tool in gee-whiz science fiction. But the hard science behind it is even more wow-inducing. Researchers are already using brain-computer interfaces to aid the disabled, treat diseases like Parkinson's and Alzheimer's, and provide therapy for depression and post-traumatic stress disorder. Work is under way on devices that may eventually let you communicate with friends telepathically, give you superhuman hearing and vision or even let you download data directly into your brain, a la "The Matrix." Researchers are practically giddy over the prospects. "We don't know what the limits are yet," says Melody Moore Jackson, director of Georgia Tech University's BrainLab. Adds Emory University neuroscience professor Michael Crutcher, "Anything can happen." At the root of all this technology is the 3-pound generator we all carry in our head. It produces electricity at the microvolt level. But the signals are strong enough to move robots, wheelchairs and prosthetic limbs -- with the help of an external processor. Harnessing that power "opens up a whole new paradigm for us as human beings," says neuroscientist Rajesh Rao of the University of Washington. Brain-computer interfaces (BCI) come in two varieties. Noninvasive techniques use electrodes placed on the scalp to measure electrical activity. Invasive procedures implant electrodes directly into the brain. In both cases, the devices interact with a computer to produce a wide variety of applications, ranging from medical breakthroughs and military-tech advances to futuristic video games and toys. Much of the research focuses on neuroprosthetics, which offer a way for the brain to compensate for injuries and illness. Jackson helped develop an intelligent wheelchair called the Aware Chair, which can be guided by neural activity. She is also working on communication programs for people who have been paralyzed by strokes or spinal-cord injuries. Implanted electrodes allow "locked in" patients to spell out messages by manipulating a computer cursor with their thoughts alone. Rao is tapping into that same concept to help paralyzed people manipulate robots to fetch items or move things around the house. With cameras to provide visual feedback, the patients and robots don't even need to be in the same room, or the same city. Rao says the technology "frees the mind from the constraints of the body." Cochlear implants are the most common neuroprosthetic. They help the brain interpret sounds and are sometimes called "bionic ears" for the deaf. Other researchers are looking for similar ways to help blind people see. Neurobiologist Ed Boyden of MIT says miniature optical devices can be implanted to convert photoreceptors into workable cameras for the brain. None of this comes cheap. Most research is funded by deep pockets such as the National Institutes of Health, the defense department and NASA. But every breakthrough brings the most advanced BCI technologies closer to the mass market. Jackson says she foresees a day when people with disabilities can spend a few hundred dollars instead of $20,000 on a workable system. Mainstreaming the technology raises some troubling issues for Crutcher, who teaches a course at Emory in neuro-ethics. He fears that expensive eye and ear implants could produce a computer-enhanced elite. "If only the rich can afford it, it puts everyone else at a disadvantage," says Crutcher, who believes many aspects of BCI are ripe for abuse. Just the idea of mucking about with a person's brain "raises questions about safety and efficacy," he says. One of the more controversial uses under development is telepathy. It would require at least two people to be implanted with electrodes that send and receive signals back and forth. DARPA, the Pentagon's technology research division, is currently working on an initiative called "Silent Talk," which would let soldiers on secret missions communicate with their thoughts alone. This stealth component is attractive, but naysayers fear that such soldiers could become manipulated for evil means. Telepathy implants won't replace Facebook and Twitter anytime soon, but that possibility is problematic as well. "You can imagine communicating with your friends through the devices, and that opens up a lot of ethical issues," Rao says. Would you want your friends and family to know everything you are thinking? Would little white lies become obsolete? These questions of morality and liability are not a huge factor for the toy makers and video game developers who are already bringing the most basic BCI technology to consumers. Games like Mindflex and the Star Wars Force Trainer use headsets with simple electrodes to monitor levels of concentration and relaxation. The signals trigger a fan that can move a ball up or down, depending on how hard you're thinking. Jackson calls it a "fascinating application of a very sophisticated technology in a very cheap package." 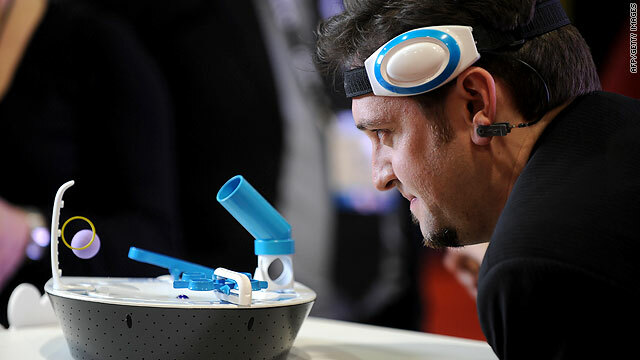 The headsets used in both games were designed by the California company Neurosky. Its corporate partners are working on games that help Alzheimer's patients improve memory techniques, teach concentration skills to kids with ADHD and let stressed- out CEOs work on relaxing. Software entrepreneurs and executives are streaming into Boyden's neuro-ventures class at MIT, looking for ways to capitalize on the array of potential uses for brain-computer interfaces. Some ventures are already up and running. NeuroVigil in California is working on iBrain, designed, in part, to help provide instant feedback to drivers who start falling asleep at the wheel. Eos Neuroscience is developing light-sensitive protein-based sensors that can treat blindness. Numerous companies are developing video games based on direct brain-computer interfacing. Neurosky sells a wireless headset that connects to any computer for a series of brain-training games. NeuroBoy lets you set targets on fire just by concentrating on them. Relax, and your character levitates. Another application lets you see a colorful visualization of your brain-wave activity. Boyden expects to see many more such products hitting shelves sooner rather than later. He says the possibilities are endless if just a "fraction of the business leaders" taking his class start "bringing the technology into the world." Jackson, of Georgia Tech, agrees: "Nothing is out of the realm of possibility." Are any of these the Web's next big thing?